Sometimes, although in my case it’s all luck, I love timing. Why am I mentioning timing in a car review? 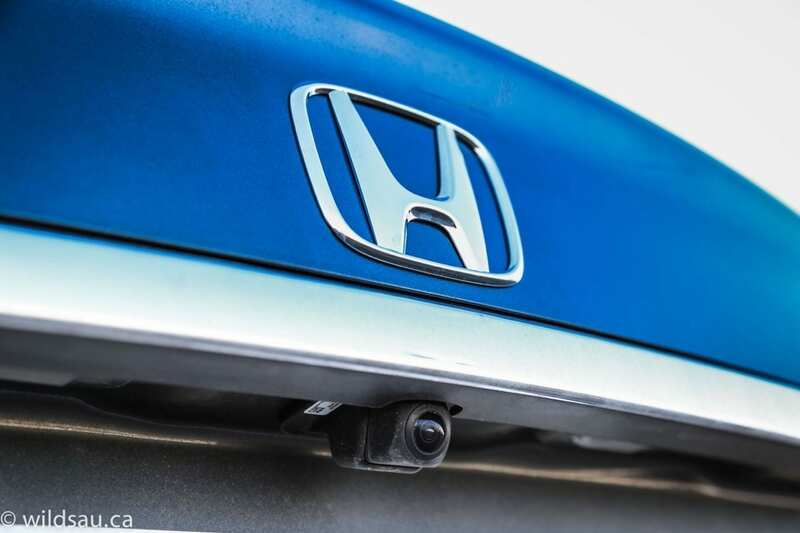 Because each month, I receive month-end reporting from all the car manufacturers, and in March 2013, the Honda Civic surged to the top of the list. Best-selling car in Canada. Excellent time to review it then, I’d say. 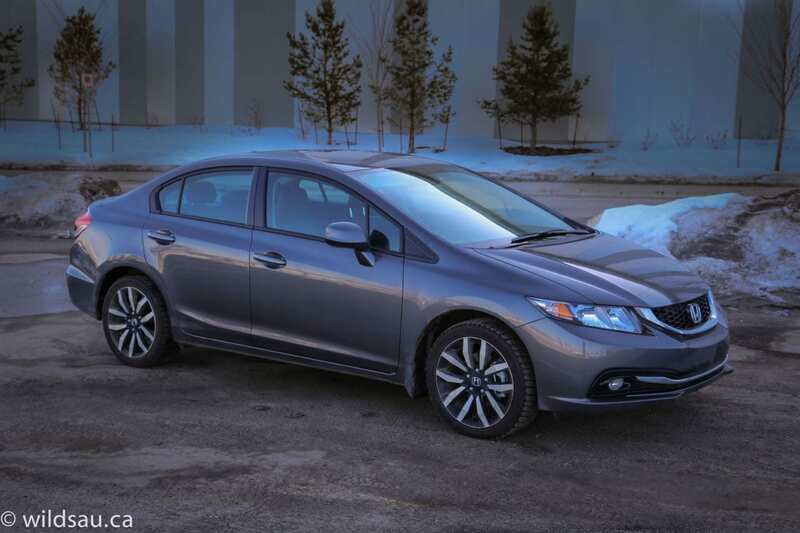 The 2013 Civic sedan starts at a paltry $15,440, but that’s not the one I had here. I had the top-of-the-heap Touring model, eclipsed only by the high-zoot Si model. 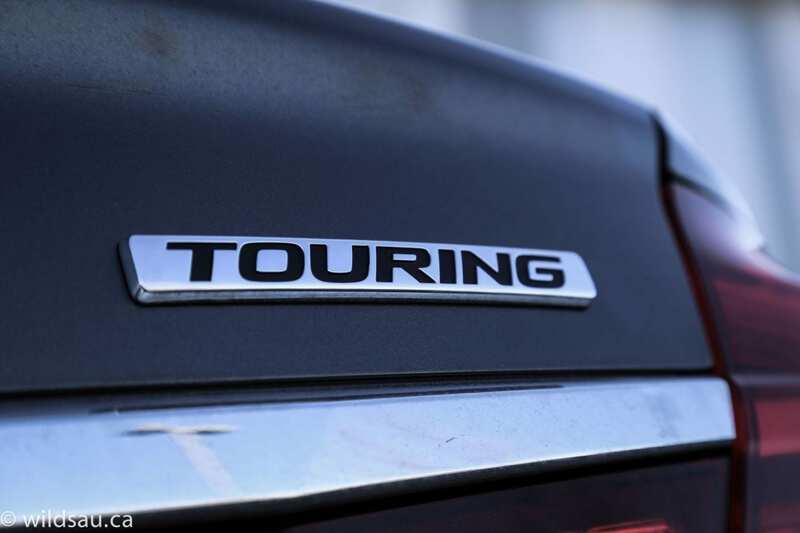 As a matter of fact, the Touring is so top-of-the-heap, there are no options available for it. 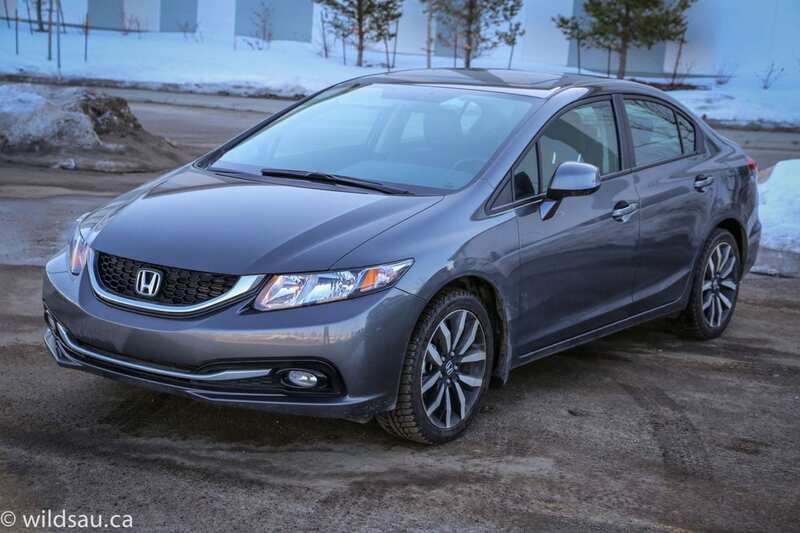 So consider this a fully-loaded Civic sedan, unless you need the sportiness that comes with the Si. You won’t find anything new, or frankly exciting here. Honda’s tried, proven and somewhat tired 1.8-litre inline-4 sits side-saddle. It still puts out 140 horsepower at 6500 RPM. As you’d expect, it’s a bit torque-poor, cranking out only 128 lb.ft of torque at 4300 RPM. 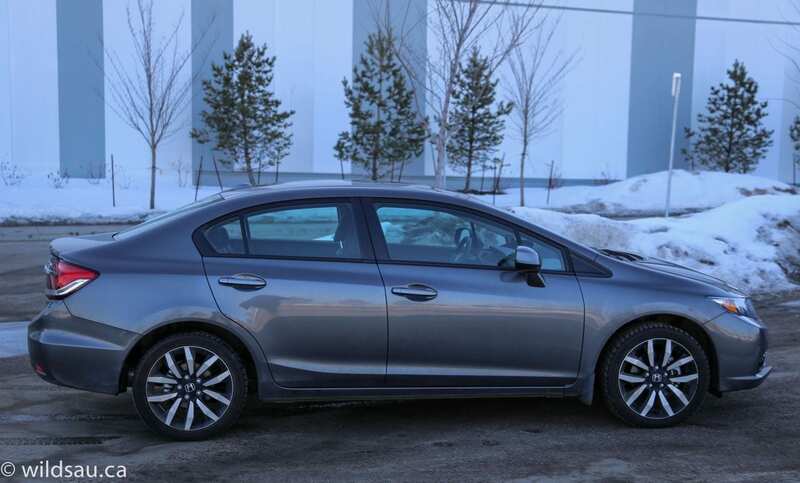 The power makes its way through a 5-speed automatic (which is a gear behind almost all the competition – except for the awesome 4-speed automatic Corolla S) and drives the front wheels. Though it seems low on numbers, the engine only needs to motivate 2855 pounds of car. That’s very light. The little gaffer sips regular fuel, and Honda says it will use 7.1 L/100 km (33 mpg) in the city and 5.0 L/100 km (47 mpg) on the highway. I drove mostly in the city, with no effort to save fuel, and had a couple of sprints down the highway – and averaged a very reasonable 8.2 L/100 km (29 mpg). The tank holds 50 litres. Honda released a restyled Civic less than a couple of years ago, which was met with almost universal derision. I reviewed it, and actually didn’t hate it. But hey, Honda heard the masses and massaged both the interior and exterior quickly, re-releasing the model in record time. Its outside lines have matured and are more pleasing to my eye, even though they are small changes. I quite like the cleaner side profile of this little sedan including the handsome kind in the rear side window, and really enjoyed the new rear end styling too. There’s some classy chrome trim under the grille, inside the lower air dam intake and on the rear fascia tying together the tail lights as well. The Touring model gets nicely integrated fog lights. Finally, the 17″ rims look really good and the 215/45-sized tires look meaty on this small car. The interior of the Civic has some strange design language going on. The materials look decent, but are almost all hard plastics. 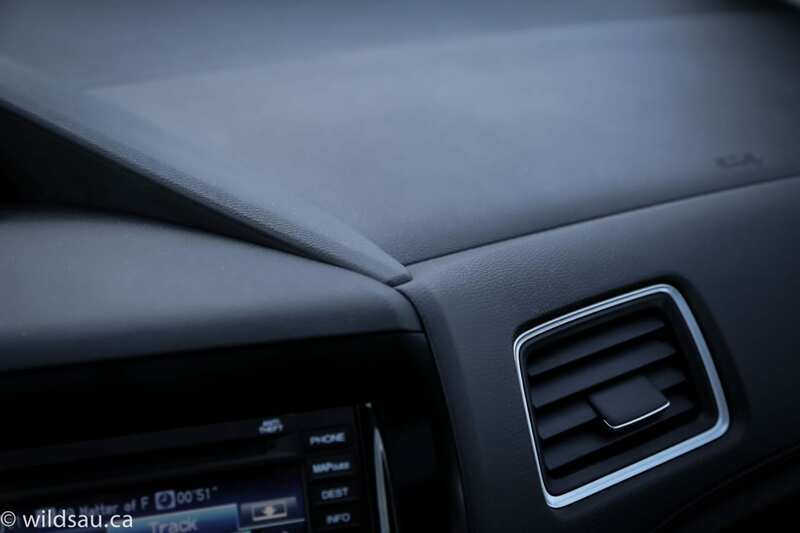 You’ll find a small swath of soft-touch plastic across the front of the dash in front of your passenger and on top of the door panels – that’s about it. Sadly, the soft-touch plastic panels have fake stitching on them. Of course the amenities are powered – door locks, mirrors and windows. 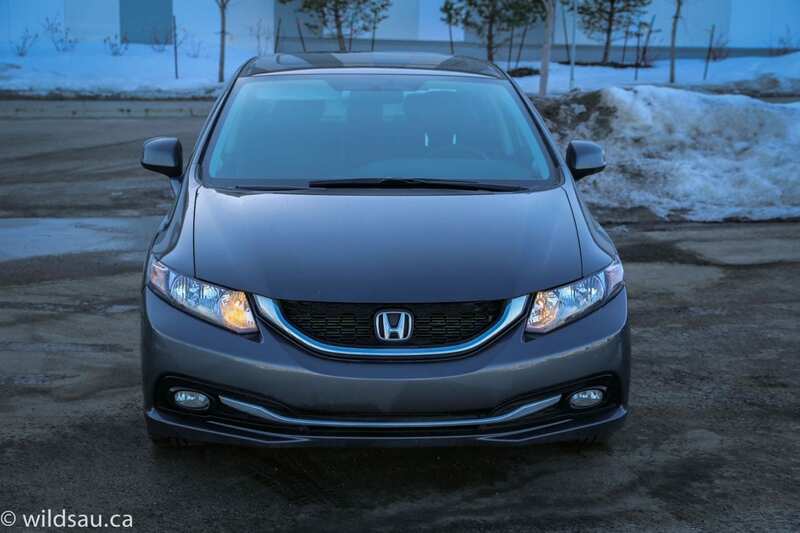 You get a good old fashioned key to start the Civic – no push-button here. The fob has remote locking/unlocking and a trunk opener. I found the headroom up front to be enough for my 5’10” frame, but not much beyond that – taller passengers will feel the squeeze. Otherwise, the cabin feels spacious enough for a small car. I really liked the seats – they are upholstered in a nice leather with contrasting stitching. They’re heated, the driver’s side is power adjustable (the passenger side is not) and quite comfortable with decent amounts of bolstering. I absolutely loved the small-diameter steering wheel – it is manually adjustable and felt near perfect in my hands. 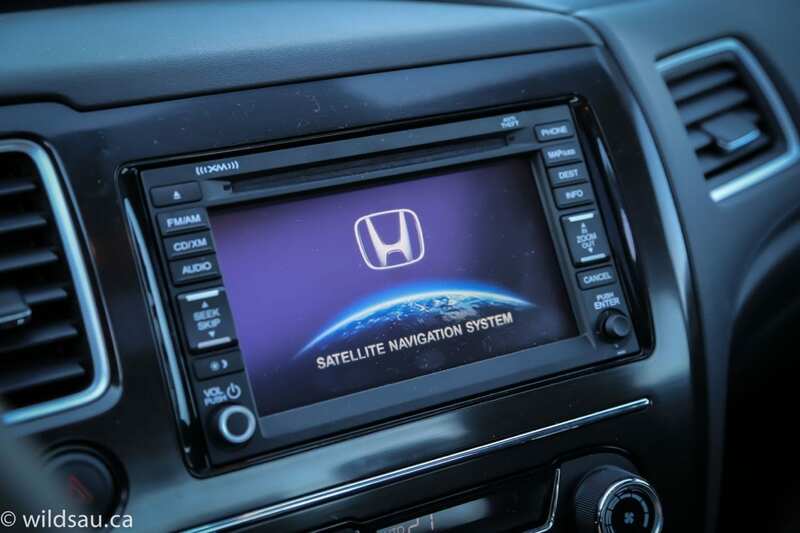 It has buttons for cruise control, the media system, phone functions and the driver information screen. The way Honda has laid out the dash is a bit of a mish-mash, but in terms of getting the information, it works. Let me explain. Ahead of you, behind the steering wheel sits a large tach. Above that is an upper “eyebrow” kind of area that houses two display parts. 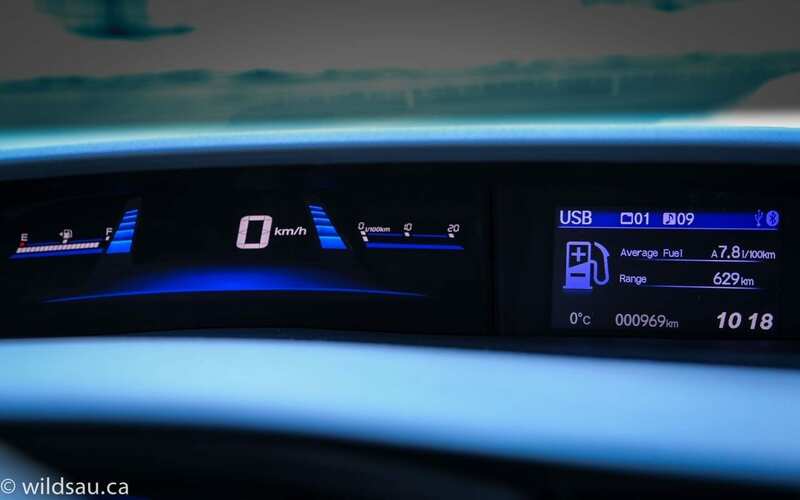 On the left is a large digital speedometer flanked by eco driving bars – they glow green when you’re driving economically, and move to blue if you’re being bad. There is also an instant fuel economy read-out and your fuel gauge. On the right is a “what’s going on” screen. It always shows a clock, your odometer and the outside temperature on the bottom, and lets you choose between displays of average fuel consumption/fuel range, digital and analog clock and date, and what’s playing on audio system. 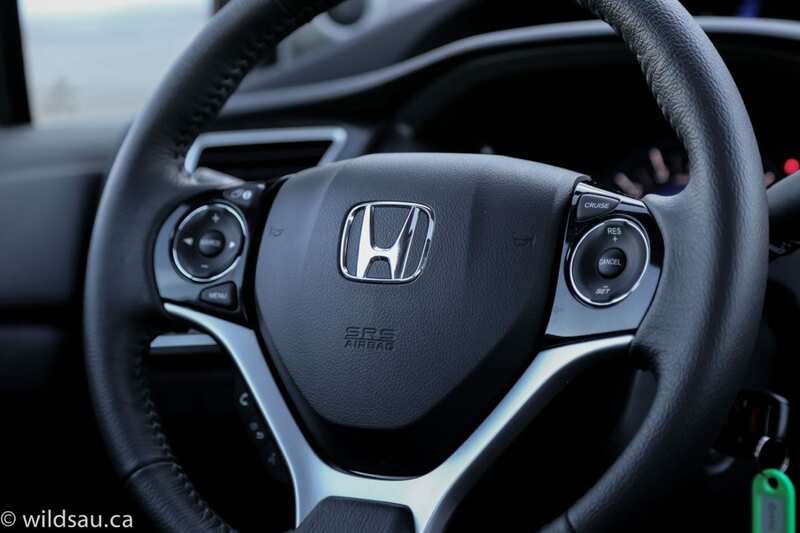 What could pass as the center stack starts with Honda’s old-school head unit at the top. It’s a touch screen but it feels way behind the curve in a number of areas. The text and the graphics look terrible – everything is blocky and crunchy and looks several generations behind most of the competition. The user interface isn’t exactly slick either. The screen handles your media, the phone, navigation and the back-up camera. That camera, by the way, is nice and clear and offers multiple view options. 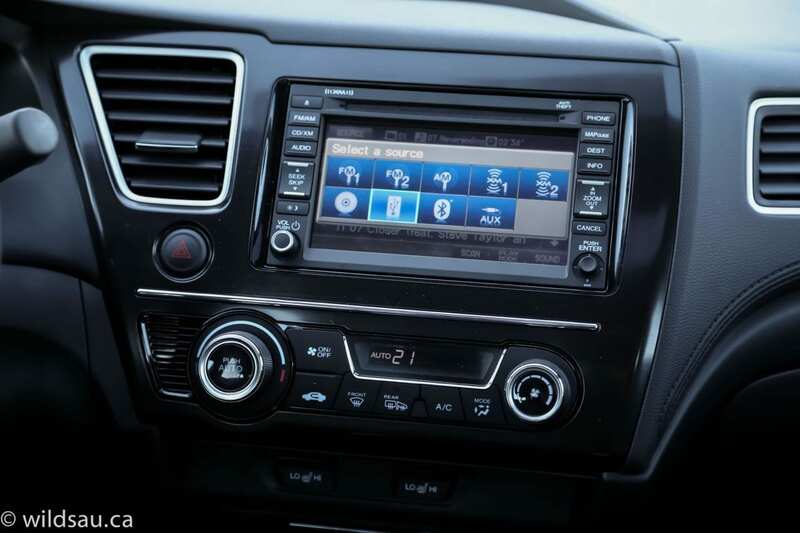 The audio system sources are AM, FM, CD, satellite radio, USB, auxiliary and Bluetooth streaming – for a basic system, it sounds quite good. 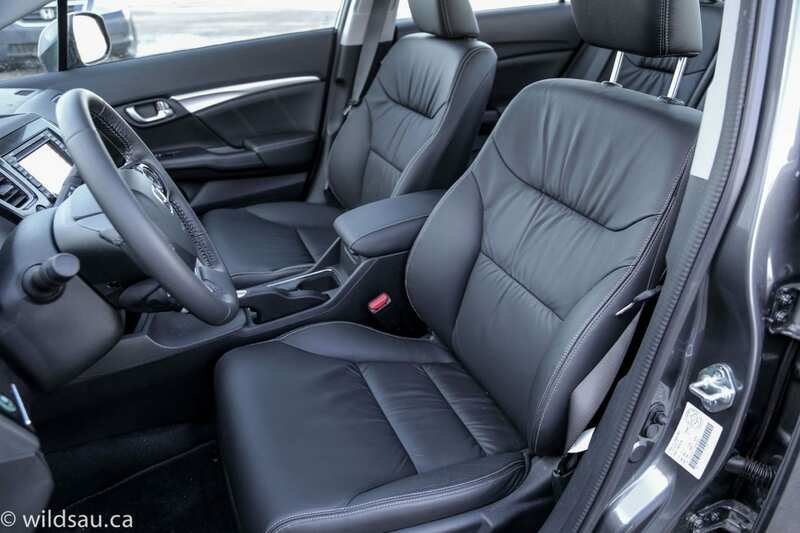 Below that sits an automatic climate control system – it’s very simple and nicely laid out – a reminder that, when they want to, Honda does ergonomics very well. 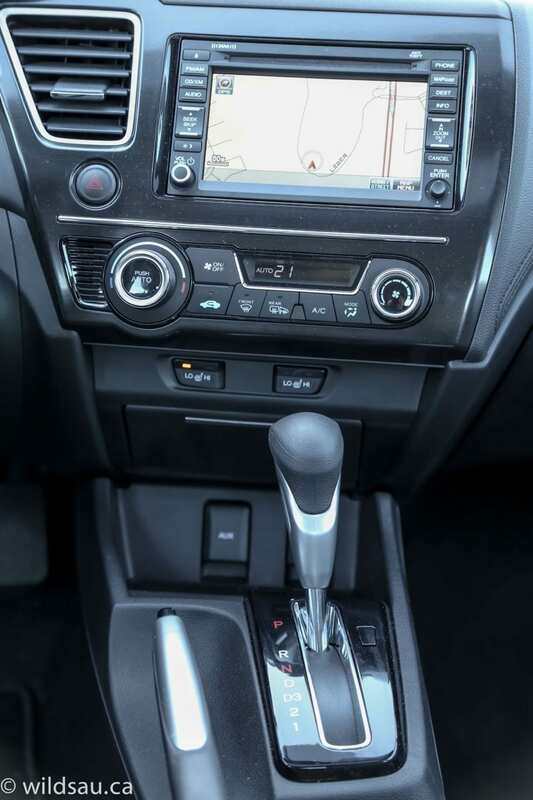 The center console houses a really dated-feeling gear selector – it has partitions for D, D3, 2 and 1. I remember our Oldsmobile had that too – in 1991. There are two cupholders and a traditional parking brake lever. You’ll find a small powered tilt/slide sunroof above you. 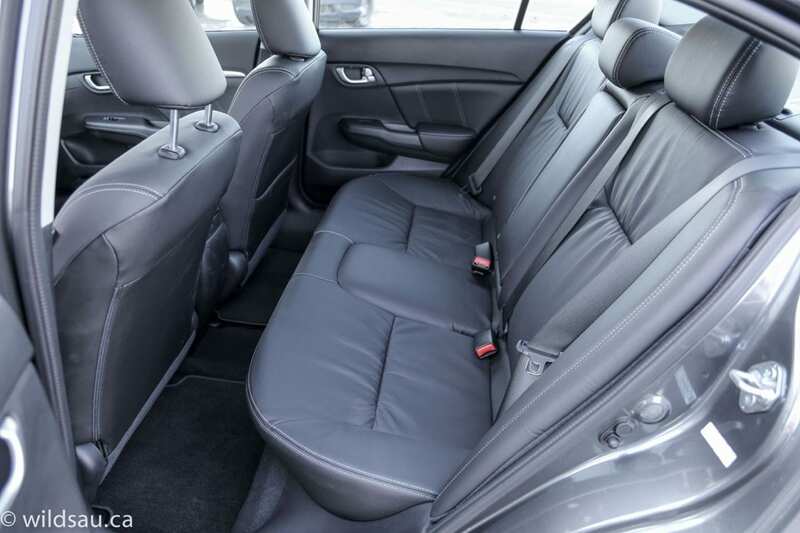 The rear seats are also very comfortable – there are three of them, each with a headrest and seatbelt. As usual, the middle position is very cramped. The leg room was acceptable, especially in such a small car, but the headroom was tight. There’s not a lot in terms of convenience. The middle seat folds down to become an armrest with two cupholders, you get one seatback map pocket and some useless door bins. That’s it. If you’re transporting kids, you get two sets of LATCH connectors for their seats. Our three kids felt quite cramped width-wise, and the little dude couldn’t help but kick the seatback in front of him. There’s nothing exciting happening in terms of storage solutions. The glove box is quite small. There’s a strangely-sized cubby hole in the center stack with a lid that flips up. I did like the shallow but highly useful open tray at the front of the center console – it’s rubberized and has the auxiliary plug and a 12V plug in it – perfect for dropping a smart phone into. You’ll find a small, carpeted bin under the armrest lid – along with the USB and another 12V plug. And finally, there’s a bizarre open slot on the left underside of the dash. I can’t imagine what you’d use that for. The trunk is small at 353 litres. I found the load floor to be quite low. The rear seats fold down 60/40 to open into a reasonably-sized pass-through – it’s not the full width of the trunk, but it could be useful. This car is not fast – the engine power builds slowly and eventually, you’ll feel it. 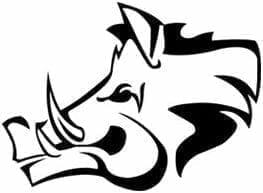 The catch is that above a certain RPM count, it gets loud and quite buzzy, which will discourage you to rev this engine up. Truth be told, it’s still not fast at those high RPMs. 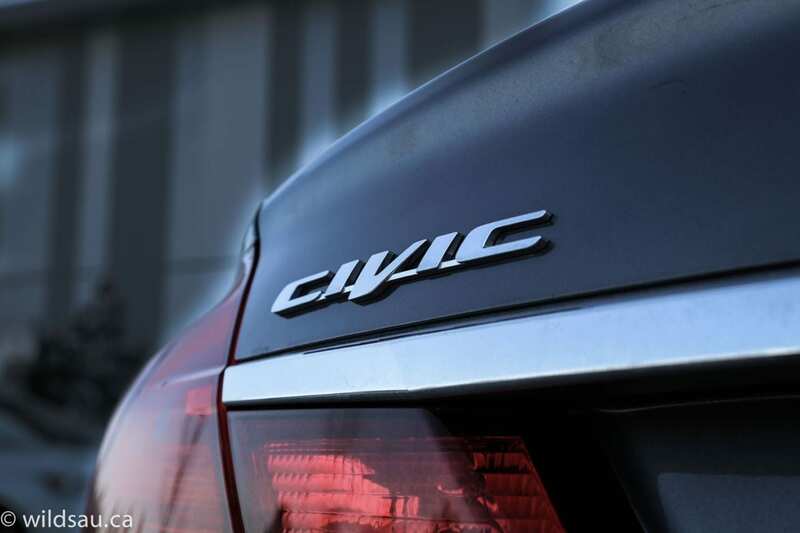 Yes, the Civic is fine for everyday driving. There’s enough jam to get into traffic, and point A to point B commuting is fine. There’s an econ driving mode – I’d say it makes the car really sluggish, but frankly it’s a bit of a dog without even bothering with the econ mode. The ride is firm but certainly acceptable around town, and we found that it smooths out very nicely on the highway. With that said, the rear suspension leaves a lot to be desired. It often felt as though the rear wheels moved in concert rather than independently, and that really showed up over bumps and around corners. Hit a dip or expansion joint in a curve, and the rear end hops over just like a truck with a live axle does. It’s unnerving. We also felt that the rear suspension got crashy over bigger hits. 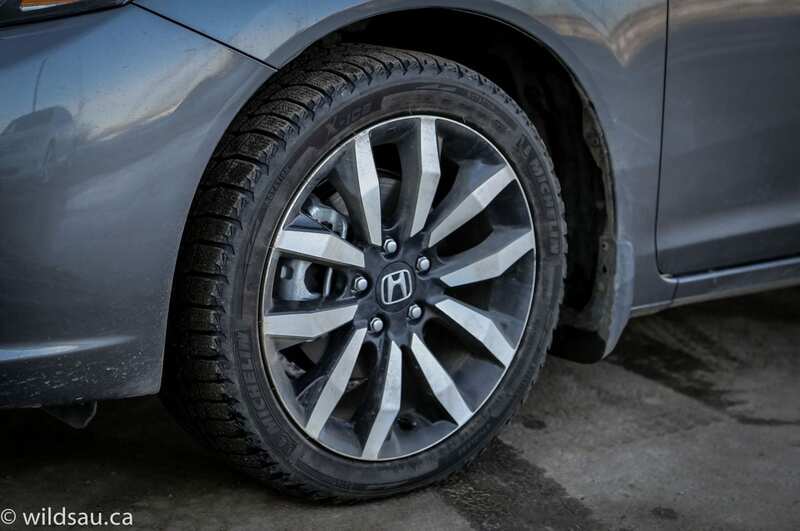 Take on a pothole, and you’ll hear it – loud and clear. It’s more sound than feeling that you’ll experience coming through into the cabin, but the hits get so noisy, you can barely tell the difference. 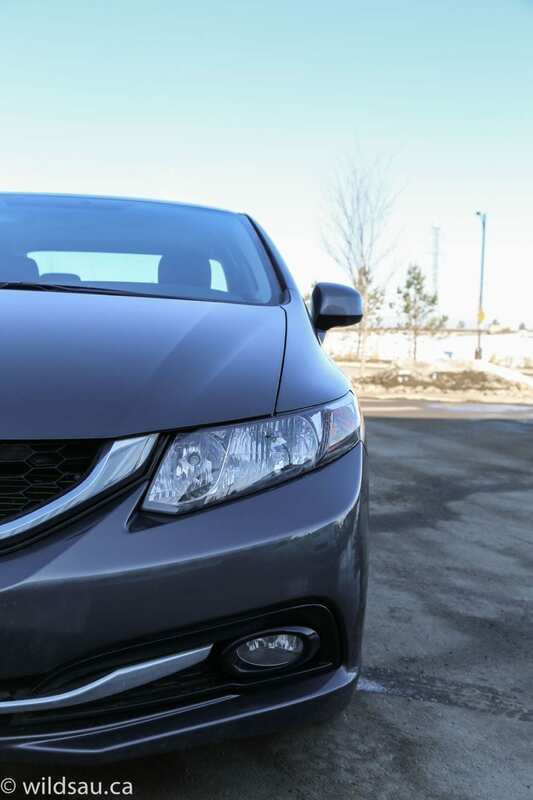 The Civic seems capable in terms of handling, but that rear suspension makes it feel weird. There’s some body lean around corners, but it’s perfectly adequate for this class. 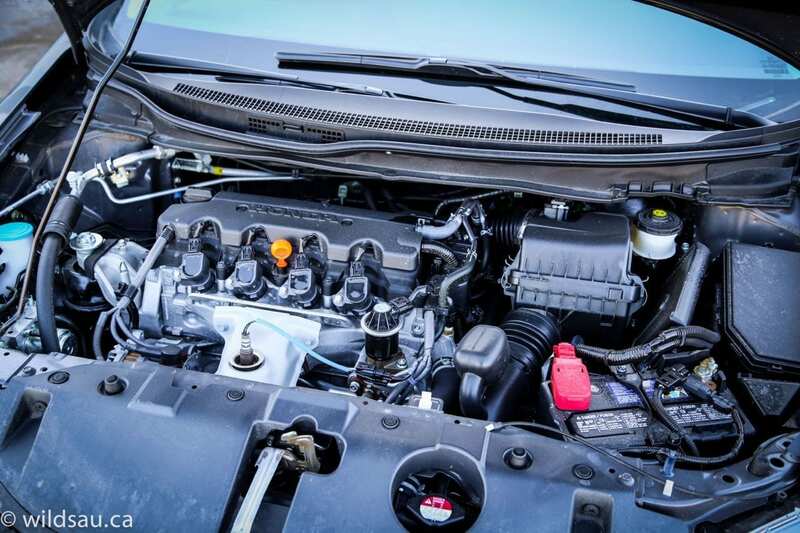 The transmission is fine – nothing special, but it works smoothly and inobtrusively. There are no manual shifting options. The brakes always felt good and effective to me. Apparently Honda has made an effort to reduce the sound levels in the Civic. But I can honestly say that this sedan is perhaps one of the loudest vehicles I’ve been in – in terms of road noise. I noticed it within the first few metres I drove it, and it never stopped bothering me. Yes, it had winter tires on, and that can make a difference, but believe me, this was definitely not all winter tires. At highway speeds, I could barely hear my wife talking – wait, maybe that’s not that bad after all. Hey! That could actually be a selling feature!!! I liked the visibility out of the Civic – you get a decent view of everything around you. I really disliked the strange convergence of 4 panels on the dash – it’s an intersection of different materials, textures, height levels and angles and it looks a mess! Others noticed it too. 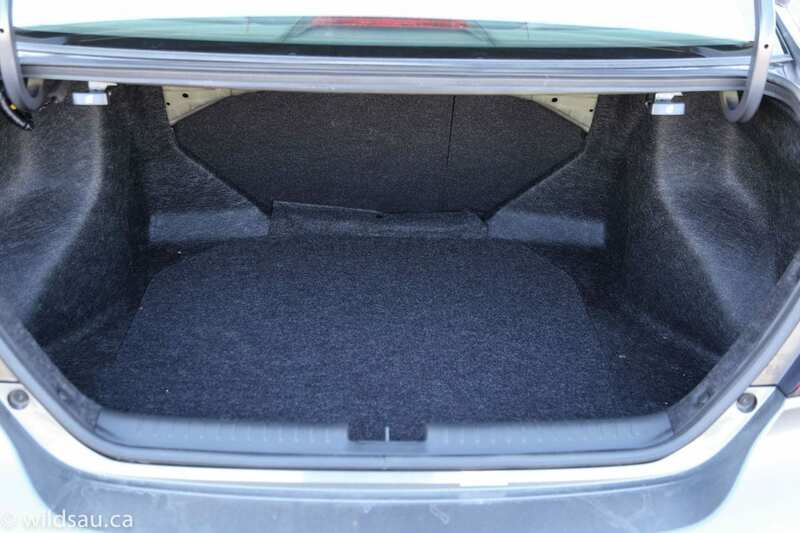 Irritatingly, you have to unlatch the rear seats from inside the trunk, then go inside to flip them down from inside. Oh, and speaking of the trunk – you can’t open it from the outside. Only with your key fob. There’s no release button on the trunk lid itself. AND that trunk lid has no handle on the inside. Which means, in places like Edmonton where cars get grimy and gross, when you close your trunk, you’ll likely be getting your paw prints on your trunk and you’ll be getting your paws very dirty. It always bothers me that the manufacturers forgo a 25 cent piece of plastic like an inside trunk handle. The Civic has the worst coverage that I’ve ever seen from the windshield wipers on a vehicle. They sweep up and out toward the side edges of the windshield, and they leave a huge widow’s peak at the top center of the windshield. It extends quite a ways below the rear view mirror. 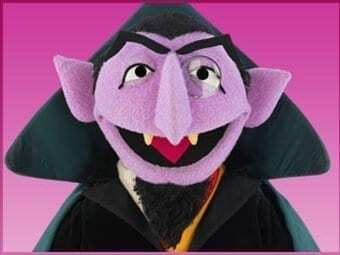 I imagine I looked like The Count from Sesame Street driving around. I was a bit surprised to find significant variance in the panel gaps around the hood. I liked the Civic overall, but I wanted to like it more. Some of the shortcomings left a lasting impression on me, and would likely impact my decision if I was shopping in this class. WAF (Wife Acceptance Factor) was about average. She said it was a nice car, but a bit different looking. She felt it did everything it needed to, but nothing about it excited her. She did comment on the road noise too, but in her opinion it was the tires. I give the 2013 Civic Sedan Touring a 5.5 out of 10. I felt the new exterior styling of the Civic was successful. Yes, there are still a couple of strange angles, but overall, I don’t think it will offend anyone. And I actually really like the side and rear profiles. The interior turned out alright too, although the materials and some of the quirks didn’t impress me. I wouldn’t mind a slightly peppier-feeling car off the line. Nobody here cares about top speed, but I wouldn’t mind if they allowed the gearing to facilitate snappier acceleration. The handling and ride are OK, but I have to say that the rear suspension is definitely a weak point. And the road noise is very, very noticeable. 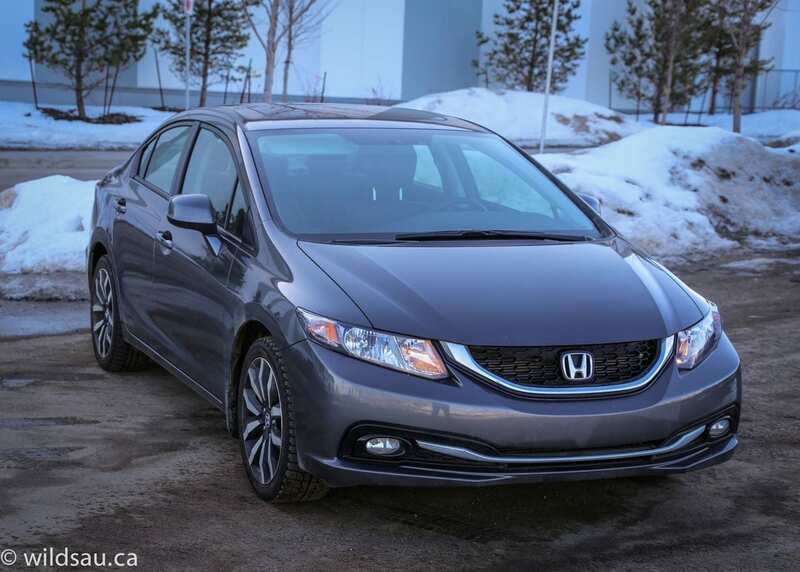 I’m relatively certain a Civic buyer can count on high reliability and strong resale value. And the Civic itself starts at a very low price. 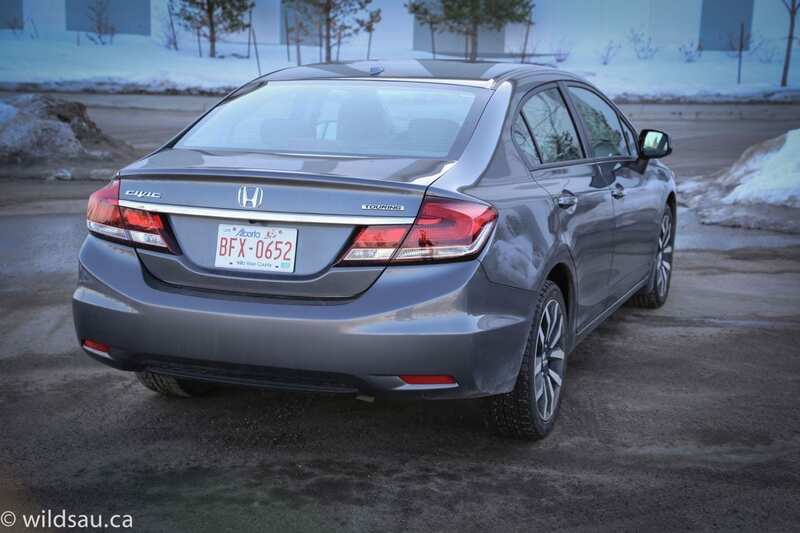 Even the Touring model, loaded as it is here, is a relative bargain for what you get, and the fuel economy is tough to beat. Although the price is a good one, there is plenty of competition at this level and in this class, and I think Honda’s got their work cut out for them. 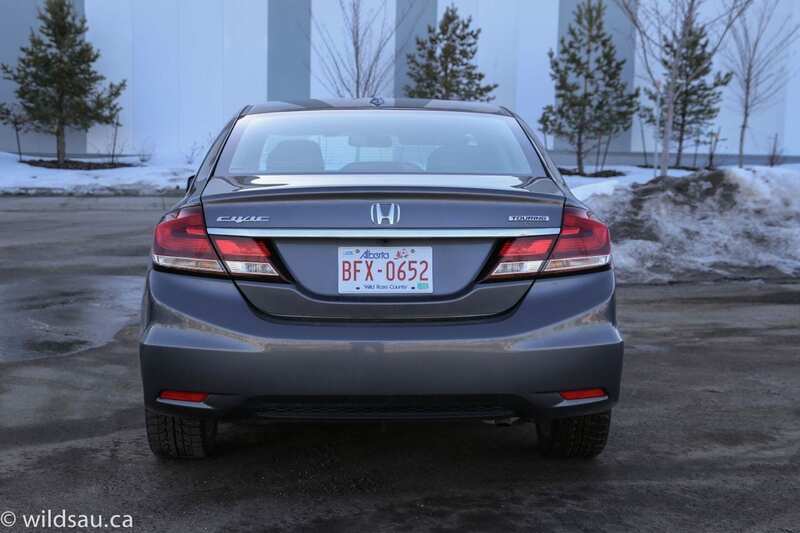 Even though I was completely sold on the new Accord I reviewed recently, I’m not nearly as sure about the new Civic. It’s certainly a good car, but I don’t think it would be the one for me. If you enjoyed this review, feel free to check out more of them under my vehicle reviews tab at the top of my blog.